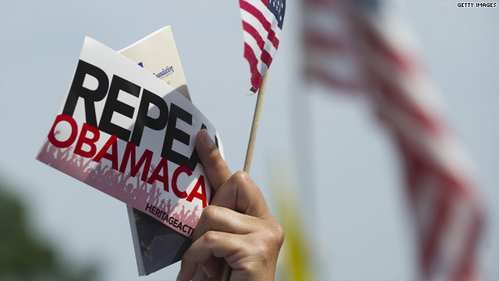 Obamacare is failing to hold down premiums. Obamacare's architects repeatedly claimed the law would reduce the typical family's insurance premiums by $2,500 a year. But year after year, in state after state, premiums have gone up. Double-digit increases have become routine, and even triple-digit hikes are not unheard-of: The premium for a middle-tier health plan in Arizona this year soared 116 percent. In the 39 states using the federal Obamacare exchange, the Department of Health and Human Services reports, the cost of health insurance has more than doubled since 2013, from an average monthly premium of $224 in 2013 to $476 today. The Affordable Care Act was supposed to reduce the typical family's insurance premiums by $2,500 a year. 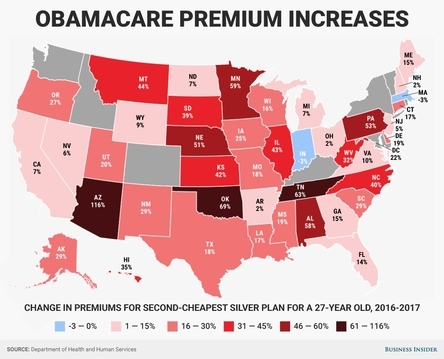 But in state after state, premiums have jumped. Obamacare is failing to provide choice and competition. Democrats and their allies depicted every proposal to reform Obamacare as a virtual death sentence for millions of Americans who would supposedly find themselves without insurance. These hysterical attacks distracted attention from the real disappearance of insurance — the one already underway. Despite skyrocketing premiums and deductibles, insurers selling health plans through Obamacare exchanges have lost billions, forcing many of them to pull out of the markets. Humana, to cite one major example, has announced that as of 2018 it will leave the Obamacare exchanges. In large sections of the country, including at least five entire states, only one insurer still sells health plans on the Obamacare exchanges. In many places next year, the options will likely fall from one to zero.